Summary: As helicopters search Northern England's Peak District for fifteen year-old Laura Vernon, Detective Constable Ben Cooper quietly dreads the worst. 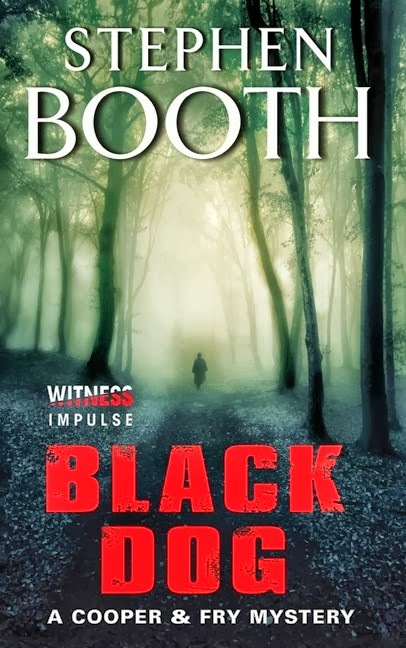 When her body is found in the woods, Cooper's investigation begins with a short list of very uncooperative suspects: retired miner Harry Dickinson, whose black Labrador discovered Laura's body, and Laura's wealthy parents. Uneasily teamed with ambitious newcomer Detective Constable Diane Fry, Cooper tests a town's family ties, friendships, and loyalties - and finds that in order to understand the present, they must unearth the past. My thoughts: Wow. This is a fantastic read. Not only am I going to wholeheartedly recommend Black Dog to everyone, I'm going to go ahead and read the rest of the Ben Cooper & Diane Fry series; if the twelve books that follow are anything like this one, I know I'll love them. It is a unique story, with all the pieces of the intricately crafted puzzle falling smoothly in place at the end. You know, in most popular mysteries (the few that I have read, anyway) the whole plot has an increasing frenzy and is the build up to a fabulous, thrilling ending. If that is the kind of conclusion you like to your reads, this might seem disappointing, a let down. Because the ending is too simple. It is so simple, that it would sound far fetched to people who are used to that grand climax. It reminded me of Stephen King's Under the Dome, for no reason other than how it made me feel; surprised and convinced, not to mention, wholly awed. It was impossible for me to have guessed it, but I know the answer had been right there all along, staring me in the face. The only disappointment I felt was for not having thought of it! But even if not the ending, there is so much to appreciate and be impressed by in this book. While still being a swift mystery, Black Dog is like a laid back character sketch of all sorts of people in your usual small town. I loved the quirky ones, of course, like Harry Dickinson. And I also liked Gwen, his wife, about whom Cooper was so right - some people just get miserably tangled in messes they don't deserve to be in. Most of all, I liked Diane Fry; because she was so realistic. I liked how, as an outsider, she provided a neatly contrasting perspective on the rest of the team; one which I couldn't easily dismiss as she was also one of the good guys. The drama in Cooper's life was overwhelming and effectively justified the few character flaws in my mind (which made him much better than a conventional Lee Child-ish detective!) The book is wonderfully written, with hilarious comments at the most unexpected times and apt vivid descriptions that bring the setting to life. 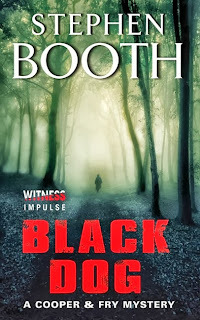 Mostly, I found Black Dog by Stephen Booth to be a perfect start to a series; which is something I hardly ever get to say. And Diane Fry and Ben Cooper do seem to make, possibly in spite of themselves, a pretty good team. This Witness Impulse book counts as another R.I.P. Challenge read. I love a northern English countryside mystery! I have put this on my wishlist (and on Kindle it´s only 2.99, what a bargain!). I really need something to follow the Dalziel&Pascoe series, which I finished a long time ago, and of which there will be no more, sadly (RIP Reginald Hill). Thank you for the tip! Viktoria - Hope you get around to reading it!